Michael Nermon is a long time member and past board member of the Specialty Sleep Association. He is Owner and President of Ergo Beds, an 18 year old retail store devoted to the “specialty” side of sleep. We are pleased to showcase Michael and his unique store here for you. Ergo Beds is a “mattress store” only in the same sense that a Bentley is a “car.” It’s not as though the beds and ergonomic furniture at Ergo have astronomical price tags – they don’t – but presenting the ultimate quality in sleep products, with expertise tailored to maximize each customer’s comfort, is our store’s whole reason for being. I grew up in the bed industry. My family’s business was manufacturing the adjustable power beds used by major mattress companies. At Maxwell Products our mission was “Adjusting The Way The World Sleeps”. During my 20-year career working with bedding manufacturers in three dozen countries, I found that in Europe mattress technologies were well ahead of those in the United States. I also had back problems and knew what a big difference a better bed could make. My familiarity with industry technologies and processes gave me the skills to customize my own bed. It led me to the vision for Ergo. When we opened in 2001, nothing like this existed. Mattress stores were like supermarkets and selection was based on firmness, price, and brand name. I wanted to offer specialty sleep products with unique benefits and share my knowledge with every customer. I joined the Specialty Sleep Association and aligned myself with the best resources in the industry. Dale Read’s marketing company helped me develop the Ergo logo. Our unique showrooms, with soft music, dim lights, and a warm, relaxing décor have earned several awards. More important, this environment helps our customers comfortably spend an hour or more – a sensible approach to selecting a bed. Instead of the dreaded, rushed ordeal experienced in brightly lit, warehouse-like mattress supermarkets, shopping at Ergo is pleasant and leads to the right decision on an investment that will affect the next 10 to 20 years of your life. All products at Ergo meet the highest performance and durability standards. It behooves customers to take their time choosing, guided by the expertise of our Comfort Consultants. In addition to being a legacy Tempur-Pedic dealer since 2001, Ergo’s unique product assortment includes the new iSense range of adjustable firmness mattresses; featuring a choice of support systems, Technogel; which incorporates a true gel layer imported from Italy, Ergo’s private label line Silhouette; featuring all-natural materials and customizable design, and our European luxury mattress options. I’m especially enthusiastic about our Carpe Diem and Jussi beds from Europe. Aside from being esthetically beautiful, their unique design provides a level of support and pressure-point relief that’s impossible to explain. Of all the qualities in sleep products we carry, our Carpe Diem and Jussi beds epitomize the ultimate sleep comfort. The beds can even be custom-ordered with different levels of firmness on either side so couples sleep in maximum comfort. 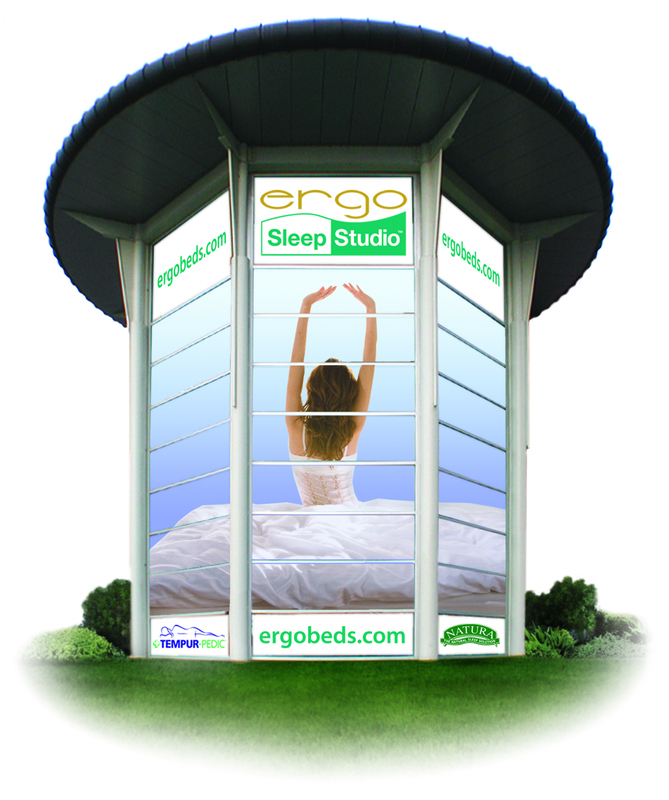 Ergo is well positioned to accommodate the growing demand for all-natural, chemical-safe sleep products. We’ve offered organic sleep products for many years because their anti-allergenic qualities align with my personal mission to help people get the full, deep, restoring sleep that is so vital to maintaining good health. Ergo features natural and organic sleep products from Naturepedic, Silhouette, Savvy Rest and other top quality producers. The internet has drastically changed the dynamics in every industry, and sleep products are no exception. Operating a brick-and-mortar retail business and providing a higher level of service while staying competitive is difficult in this environment. Even exclusive products that can’t be shopped online are a bigger challenge to market to a consumer who is being bombarded by the plethora of information from online companies who profess to be “experts” in a field that they’ve only recently been involved with. These well-financed marketing machines are a real challenge to compete with on the budget of a small brick-and-mortar store operation, especially since the glut of online sellers has driven the cost of internet advertising to unreasonable levels. Consequently; finding new customers has become a very expensive challenge. It’s been said many times; the best advertising is “word-of mouth” and we are truly grateful for the strong repeat business and referrals that we continue to get from our highly satisfied customer base. We have experienced a lot in our ever-evolving industry, and Ergo has made the difficult moves in this rapidly changing marketplace. Now; after devoting the past 18 years to the retail space I have decided to focus my energies on the manufacturing/supply side of our industry again. I plan to “retire” from operating my small retail business and I look forward to working with both manufacturers and retailers to share my experience and help them build their businesses. We are in an exciting, innovative industry that holds a lot of opportunity for everyone who can dream about better sleep.